On 16th July, IfM’s Centre for Science, Technology and Innovation Policy (CSTI), together with the ECS Policy Links Unit and the Babbage International Policy Forum, hosted a roundtable event for manufacturing foresight practitioners and policy analysts from leading multilateral organisations and international bodies. Participants included representatives from the Organisation for Economic Co-operation and Development (OECD), United Nations Industrial Development Organisation (UNIDO), the World Economic Forum (WEF), the United Nations Conference on Trade and Development (UNCTAD), as well as the UK government. The event was designed as a unique opportunity for experts from the different organisations to share insights, perspectives and analyses about the future of production; and reflect on the implications for industrial strategies and national policies for manufacturing and innovation. In particular, the roundtable event offered participants the opportunity to compare and contrast their different initiatives and findings, and share effective practices and lessons learned from their respective initiatives, as well as to explore common methodological challenges related to manufacturing foresight and policy analysis. Challenges for small and medium enterprises to stay relevant in future value chains. CSTI and Policy Links were ideally placed to facilitate discussion: Having worked recently with the international organisations involved and realising that were common interests, it was apparent that there was an opportunity to bring together a community of practitioners and provide an opportunity to share ideas and experiences. 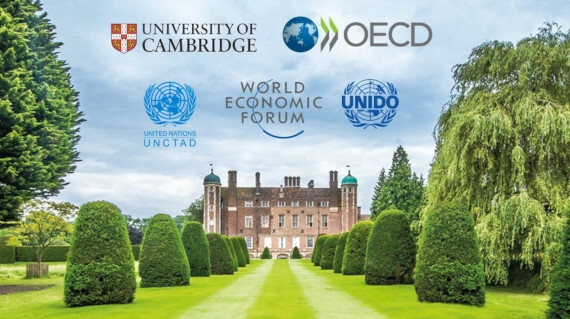 The event was also supported by the Babbage International Policy Forum, with former Head of the IfM, Professor Sir Mike Gregory, chairing the opening session and hosting a dinner at Madingley Hall, which provided an ideal location for this type of international expert roundtable meeting. The meeting concluded with agreement to continue to reconvene and build this community of interest. Topics identified for future discussions included: measuring national readiness (for adopting and exploiting key emerging production technologies), identifying the skills and workforce requirements for the next production revolution, identifying barriers to the diffusion of new technologies.